For £199, this pedal will let you in on one of rock’s best-kept secrets. Could be too much gain for some. 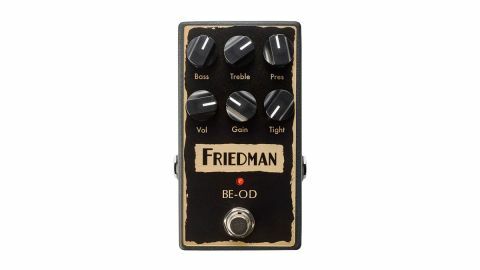 The BE-OD pairs down Friedman’s Marshall-inspired BE-100 amp to pedal form. Control-wise, it’s the most preamp-like here and there’s an internal gain trim pot, too. Maxing out the gain, you’d think it was already turned up full, but a quick look inside reveals that it’s factory-set to halfway! In truth, cranking it past three-quarters is too much, but it’s a nice addition. This is a cracking all-round distortion. Its defined bite and increased output is very noticeable and the tight control does exactly that - removing flab - and the BE impressively retains its character across the gain spectrum.